What does seeing baby roaches in your home mean? The answer is you have a major problem. They are a sign of severe infestation, and they scream DANGER! You’ll have hundreds, even thousands more very soon here if you don’t stop them. Follow the instructions here to find out what you need to do ASAP. For those of you who are a little short on time, here is a quick summary of what you need to do right away. You will need pesticide/lawn fertilizer sprayer to apply the pesticide and IGR that will put a stop to them. Treat your house with a combination of DemonWP and Gentrol. DemonWP is a hard to beat pesticide that will kill them within seconds of contact. 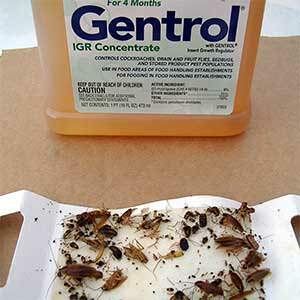 Gentrol is an insect growth regulator that will stop the nymphs and juveniles from ever reaching adulthood; meaning they won’t be able to produce more roaches. Use sticky traps. Bait the center of the traps with small amounts of sugar/fatty baits. Catchmaster is my favorite. What Do Cockroaches Look Like As Babies? You need to know the difference between small adults, juveniles or babies. Know the average size of the type of cockroach you are dealing with and know what they look like (colors, wings, stripes, etc.). The babies are much smaller than the adults; which is why you need to know the average size of an adult. The first thing you need to do is determine which type of cockroach you’re dealing with. Once you know what you’re dealing with and how big an adult is supposed to be, you can quickly just compare them visually. If there are a few that are smaller than what they’re supposed to be, then you’re dealing with nymphs or younger, non-adult roaches. Juveniles and nymphs are also not fully developed. They will usually not possess certain features of an adult. Many species of roaches will have wings and stripes. If it’s missing wings entirely, and the adults are known to have wings, then you know what they are. Like I said above, having baby roaches means you’ve got a cockroach problem, and it is a big one. If nymphs and juveniles are running around, then that means some adults are reproducing and creating more and more of them. The tiny bit of good news is it doesn’t always necessarily mean you have a full-blown infestation yet. Although, I’ll have to be honest and say that the chances of that are pretty slim at this point. If you got lucky, then it could just mean you are about to get hit with a significant problem. However, this issue is going to explode very soon, and when it does, it’s going to be very difficult to solve should. That’s why you need to stop those roaches before they get that chance to make your life a living hell. Ok, the chances of this being true are very rare, but it’s still a possibility, so I felt I needed to mention this. You may have just introduced an egg sac from the outside, and it just hatched; this is usually from cardboard boxes and other packaging. Or it could be that a female cockroach carrying an egg had hitchhiked itself into your home, or came from somewhere else. Either way, it doesn’t change anything. What does an egg look like? You can find more details and learn to identify them here. A single egg sac, depending on the species of the cockroach, can contain maybe over 40 eggs or more. While this is a possibility, I would say that it is likely not the case. It’s best to assume the worst and treat it as so. You want to stop them right now, and nothing else will get the job done faster. Not killing them ASAP could give them the chance to grow, reproduce and explode the population—the one thing you want to avoid. What Does it Mean When You See a White Cockroach? The chances of seeing white cockroaches are rare. Although, a white cockroach in itself is not very rare at all. 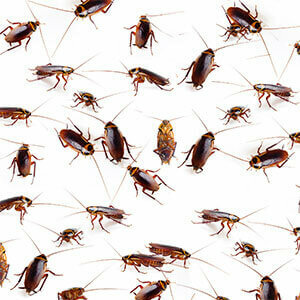 In fact, all roaches are white at numerous stages of their lives. 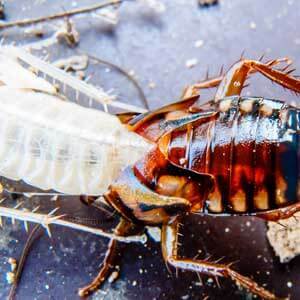 A cockroach will be white right after it has molted, or has just hatched from an egg. They are white because their exoskeleton has not set and turned dark yet (the color you are used to seeing). After molting, or hatching, it will take several hours for their skeleton to harden and darken in color. You won’t see white roaches too often because they’re incredibly vulnerable to predators and injuries. It’s also tough for them to move around freely and quickly. Without a hardened protective exoskeleton, they tend to stay well hidden to keep alive. Should you be concerned if you see white roaches? Yes, you should be worried. It’s a definite sign they are molting; in other words, they are growing. They were juveniles, and now they’re growing into adults. Once a cockroach molts into an adult, it becomes entirely capable of reproducing and creating hundreds more. If you haven’t seen any identifiable baby cockroach yet, a white cockroach is a clear sign that you do indeed have them. Why are they dangerous? What are the risks should you choose to ignore them? As I said a few times already, the most significant threat is a giant infestation. If you already have an outbreak, then their numbers and the problems they bring with them will only multiply and get worse. Leaving them alone and allowing the population to explode will only cost you more in wasted money to remove them, wasted time, and a lot of frustration and stress; because it will seem like nothing will dent their numbers no matter what you do, try, or hire. Why Do They Multiply So Fast? Let’s not forget that one single female can produce an egg sac that contains over 50 roaches or more. One female will also produce multiple egg sacs within one lifetime. One single cockroach can produce hundreds more. You don’t just have a single cockroach in your home. There is a good chance you have hundreds or maybe even thousands of them that could produce hundreds more. There are so many of them, and each one is able to multiply the numbers by up to 50 times. This is what makes them dangerous and why they can multiply so fast. The only thing you need to do is get rid of them. That means to kill them off. There’s no time to find a friendlier way of removing them. After all, you can’t just ask them to move out. Even if we were in some bizarre, alternate world, where they understood you, they wouldn’t even bother to consider your request anyway. You have two options. One, you hire a professional exterminator to come and take care of everything. Or two, you kill them yourself; and you do it immediately. Option number one is great for those who can afford the extra monthly expenses. However, option number two is way more practical for most of us who have a tighter budget. Use traps (such as the Catchmaster glue traps) to catch any others that might have missed the contact killer by luck. There are other traps you can use as well. Mix and apply an insect growth regulator (I recommend Gentrol) to stop them from maturing into adults that can reproduce. Roach baits. Which roach bait works best? I’d recommend checking out my my in-depth coverage of Advion’s roach bait. I recommend hitting them hard and fast with contact killers, traps and then IGRs. Once the number of juveniles stops increasing, you can switch over to baits and boric acid. Or you can even start considering a more natural remedy. Whatever you choose, you need to make sure they can produce more first by stopping them as fast as possible. If you choose to exterminate them yourself, then you need to know about IGR, or insect growth regulators. I mentioned them a few times earlier, but I can’t stress enough how important it is to use IGRs with; regardless of which method you choose to use. You can’t use IGRs alone though because they will not kill. Just as their name implies, they are only growth regulators. That means they stop baby roaches from molting into adults. Stopping the juveniles from reaching adulthood means preventing them from becoming capable of reproducing. IGR’s are imitated juvenile hormones. For an immature cockroach to molt into an adult, there has to be no trace of adolescent hormones left in their body. Exposing them to these imitated hormones trick their body into thinking they are not ready to molt into adults. So as you can see they don’t kill them. Growth regulators just stop them from being able to reproduce. Keep in mind that this does not affect adult roaches whatsoever. Again, it doesn’t kill cockroaches. It is critical to remember this fact because so many people have attempted to use IGRs alone for adults, only to get mediocre results and give up. When you’re looking for an IGR to use, you’re probably run into various brands. Each manufacturer may use different active ingredients, or it may say something different on the label. It doesn’t matter what’s in it as long as it’s an IGR, it should do the job just fine. Remember to read the labels, warnings, and instructions before you use it. You can also mix them right in with a pesticide in the same sprayer. Don’t delay and let this problem grow into an even bigger one that can potentially get beyond your control. 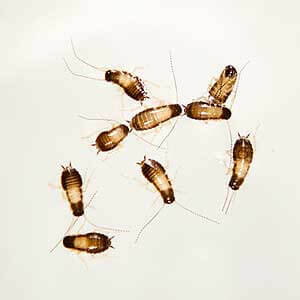 If you see baby roaches in the kitchen or anywhere in your home at all then, learn to identify them correctly (more details about identification can be found here), and follow the steps here to get rid of them for good.